With new evidence that the middle class may be vanishing, the role of unions in driving the expansion of the American middle class in the mid-20th century is a hot topic again. Arguments for worker power are rooted in research that shows that unions help families build wealth and secure the wages they need to create opportunities for their children. 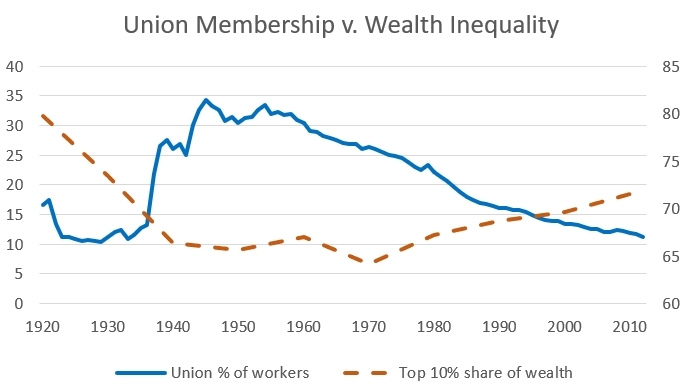 Unions have been a partisan issue for decades, but the best statistical models reveal that the relationship is simple: the more people join unions, the more wages rise and the more wage inequality declines. Despite the troubled history of racism in unions, the wage premium for workers is even higher for less-educated workers and workers of color. How to make the value of unions visible? The Economic Policy Institute put together a strong chart showing how income inequality, but they missed two opportunities: using a secondary axis to normalize scale and tracking wealth inequality. At the top of this post is what the chart looks like tracking income inequality with a secondary axis on the right. The regression studies linked above are a crucial part of the picture, and without them the graphs above wouldn’t have nearly the power that they do. With the backing of statistical models, these charts make visible how important worker power should be to any vision for a more equal world. ← Political exclusion patterns: who gets ignored?